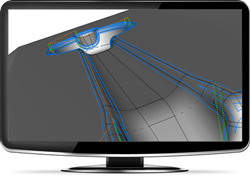 CAD-CAM software developer, BobCAD-CAM, Inc., has announced a new webinar to show 5 easy ways CNC programmers can improve 3D machining. It’s more important than ever to stay current on newly developed features and best practices so that manufacturing businesses can stay competitive and improve their overall productivity, quality of product, and profitability. The webinar host, Cody Sheppard, Senior Technical Advisor at BobCAD-CAM, will be using the company’s new BobCAD-CAM V28 Mill 3 Axis Pro software. The presentation will highlight features machinists should be using to create the most efficient and effective machine programming for 3D jobs. The new BobCAD-CAM software released Q3 of 2015 with over 20 brand-new programming features that improve 3D machining power. The new features include faster drawing power, smarter hole making technology, better surfacing toolpaths, more tool type options, an improved simulation, new mill turn capabilities, and much more. For a complete list of new features, go to BobCAD.com. Next week’s webinar host, Cody Sheppard, is a professional certified BobCAD-CAM Software Operator. He’s completed advanced coursework with both BobCAD-CAM and SOLIDWORKS™ training programs. As part of his job, he demonstrates the latest CAD-CAM technology and shows programmers around the world new ways to program better parts in less time. Registration will be open through the start of the webinar, or until full. Space is limited, interested parties are encouraged to sign up early to secure a spot. Free demo copies of the new BobCAD-CAM Version 28 Mill 3 Axis Pro software are available on BobCAD.com. For 30 years, BobCAD-CAM has been dedicated to designing powerful, user-friendly and affordable CAD-CAM software. BobCAD-CAM products are used in CNC machine shops and schools all over the world - helping to automate the programming process for mill, mill turn, lathe, router, plasma, laser, waterjet, and wire EDM CNC machines. They also provide solutions for CAD, artistic CAD, nesting, solid machine simulation, custom g code post processors, comprehensive training, and support packages.